Porcupines are classed as a rodent and they can have up to 30,000 or more quills. There are also a herbivore; meaning they eat leaves, herbs, twigs, and green plants such as clover. In the winter, they can eat bark. They also climb trees to find food and spend most of their time up there. 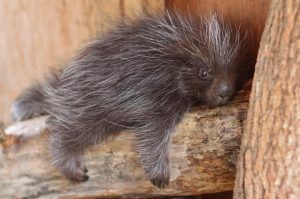 Contrary to popular belief, porcupines do NOT shoot out quills! The back end and tail of adult porcupines are covered in quills, and when threatened, they will face their back end towards the threat. 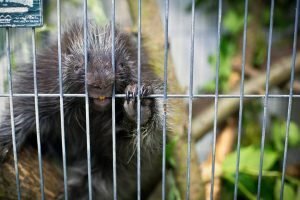 If the threat is too close, a porcupine can swing it’s tail or back end into the threat, and the tips of the quills act like barbed velcro, so they attach to whatever is struck, and are released from the porcupine. Each quill has a tiny barb on the end, so they don’t pull out like a straight needle. 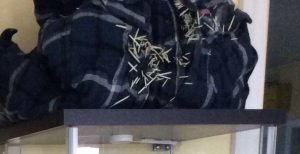 So keep in mind that if you ever need to transport a porcupine, don’t use a blanket or any material, the quills will get caught in it. Use a cardboard box or a plastic bin to transport them. Here is a picture of a flannel shirt that a porcupine came to us in. We spend a lot of time trying free the porcupine without pulling too many quills that we’re tangled in the shirt. Ricky the Porcupine doing well at Aspen Valley! A group of Procyon Wildlife volunteers attended the NYSRC conference and got an update on our Ricky from one of the volunteers at Aspen Valley Wildlife Sanctuary. He is doing really well, climbing like a pro and spending time with his new buddy being a porcupine. They play and cuddle together. He is happy and healthy and they will be released together in the spring. During the summer, adorable looking Ricky was a Procyon volunteer favourite because of his yellow ‘teefs’ and sweet personality! To continue with his rehabilitation, it is important he be socialized with others of his kind and age group, so we are happy he is enjoying spending time with his new playmate at Aspen! #DYK a group of porcupines congregating is referred to as a prickle?